Chocolate. Peanut Butter. Banana. Brownies… Mind. Blown. Each of these things on its own is incredible, but mixed together…wow! I found this recipe online a few years ago while searching for a dessert that our dinner guests, who are vegan, could enjoy. The best part? I already had all of the ingredients on hand. While we loved the brownies, I haven’t made them again since. Perhaps you remember me mentioning in previous posts that I’m not the best baker? The recipe has been tucked away (though not forgotten) in one of my recipe binders, but feeling the need for a dessert post, I decided to break it out again! As you can see, most of the ingredients are things that you probably already have at home like me. You don’t even have to use a fresh banana. I used one from my freezer to make this batch (but I did use a fresh one for the picture). Even more exciting than knowing there would be warm dessert after dinner, I was looking forward to using my new set of Chevron patterned mixing bowls and matching apron that one of my oldest and best girlfriends, Laura, sent me for my birthday. Putting the recipe together is simple. Before we get cooking, start by preheating your oven to 375 degrees. 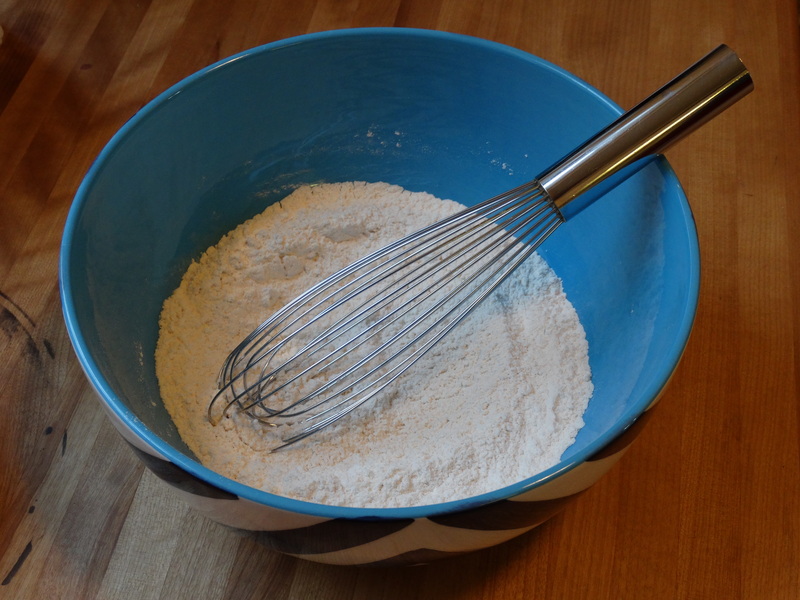 First, add one cup flour, 1/2 teaspoon baking soda, 1/2 teaspoon baking powder and 1/4 teaspoon salt into a medium sized mixing bowl. I used a whisk to mix the ingredients together evenly. In a separate larger bowl, add one banana and one cup sugar. Use a fork to mash the two together until you have a delicious banana/sugar paste. 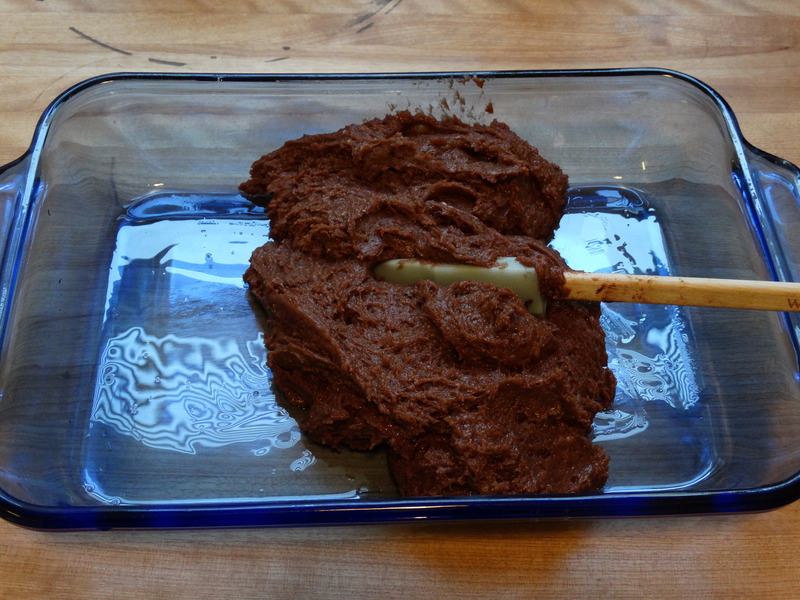 While you are doing this, melt 1 ounce of baking chocolate in the microwave, about 30 – 45 seconds. 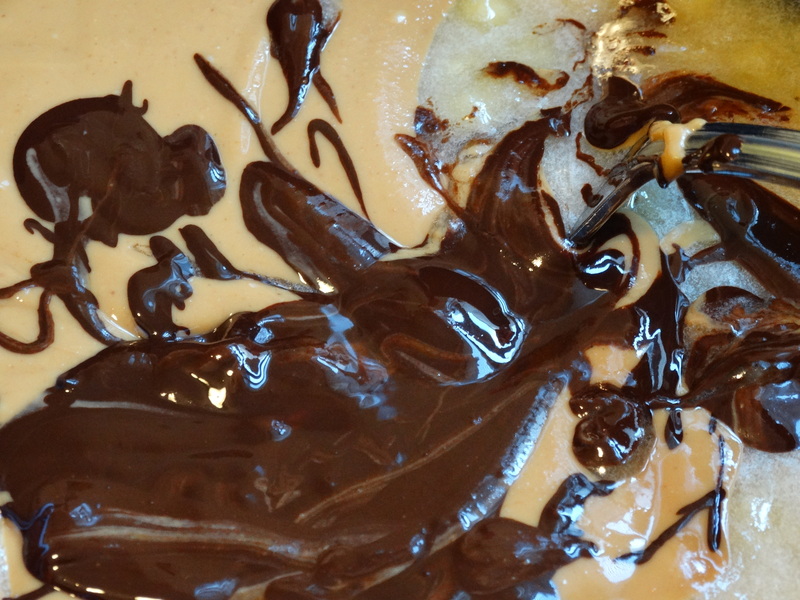 Next, add 1/2 cup room temperature creamy peanut butter and melted baking chocolate to your banana mixture. Stir to mix. 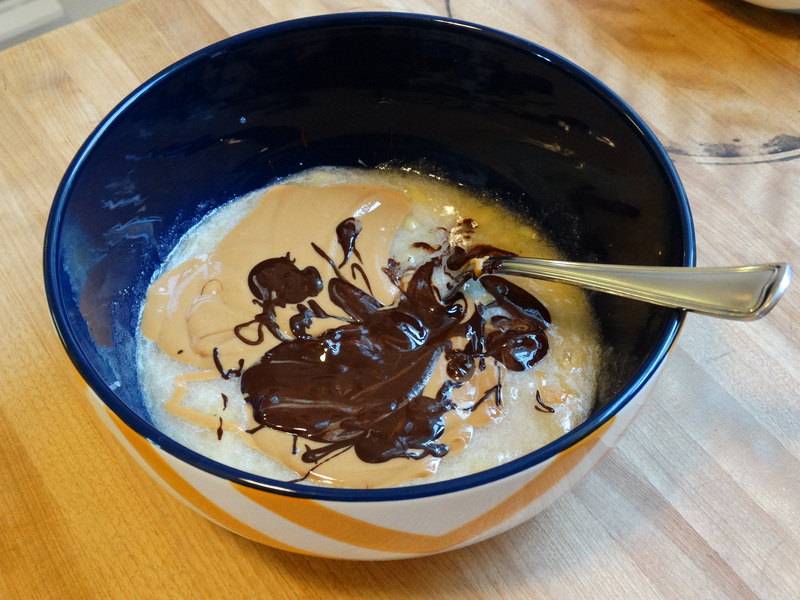 Now it’s time to combine your two bowls into one to make the batter. Add half of the flour to the banana mixture, along with 2 tablespoons soy milk. Stir to combine. Add the remainder of the flour and last 2 tablespoons milk and stir until completely mixed. The batter will be VERY thick. Note: You don’t have to use soy milk. You can use other non-dairy types of milk, such as almond or rice. If you don’t need vegan brownies, you can use regular milk. Pour your batter into a greased pan. 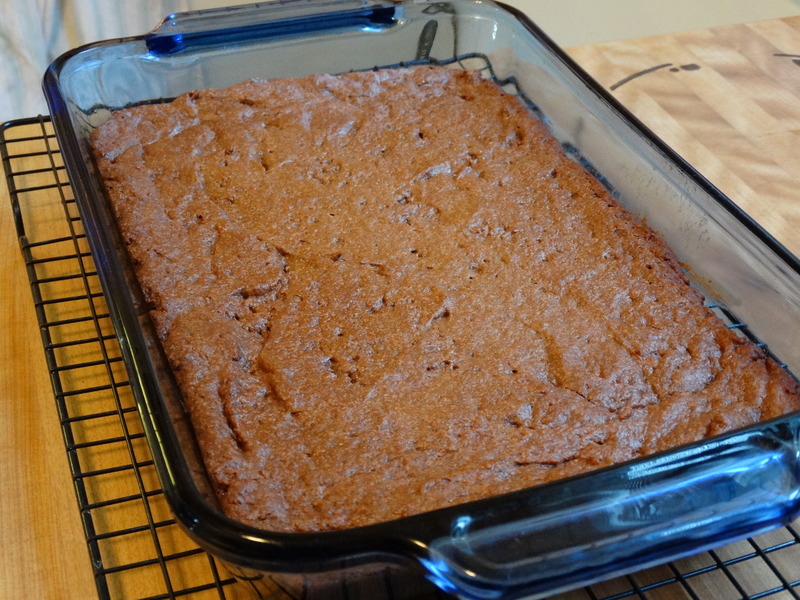 You can use an 8″ x 8″ pan for thicker brownies, or an 8″ x 11.5″ pan for slightly thinner brownies. 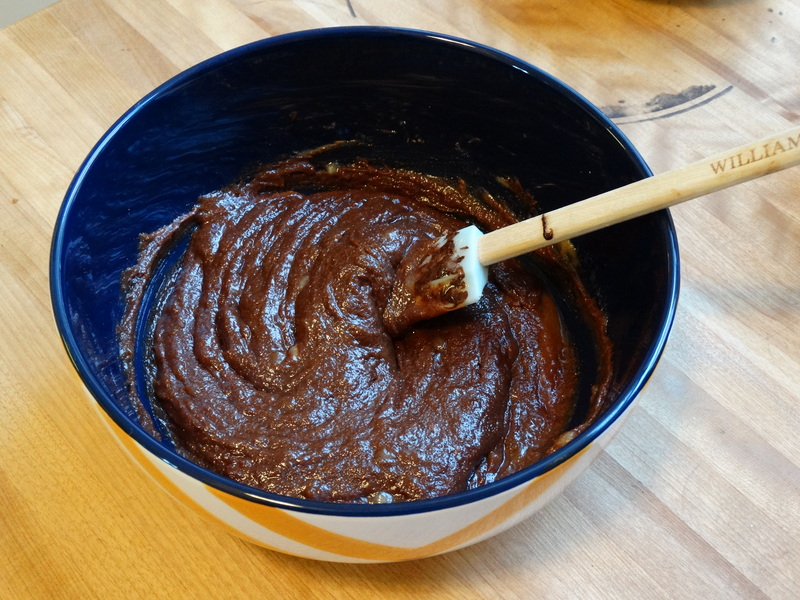 You will likely need to spread the batter to the edges since it is so dense. 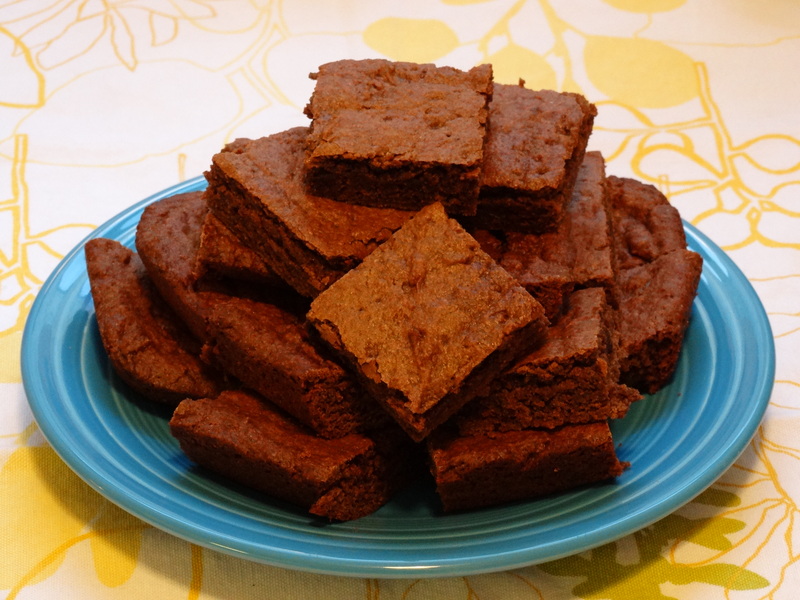 Once your oven is preheated to 375 degrees, bake your brownies for 25 – 30 minutes. You can insert a toothpick into the center to see if it’s done – when your toothpick comes out clean, they are ready. Since there aren’t any eggs involved, it’s okay to leave them a little under cooked if you prefer your brownies extra chewy! Eat them on their own or serve them with some ice cream! We used coconut flavored soy ice cream the first time we them and it was a perfect match. Enjoy! 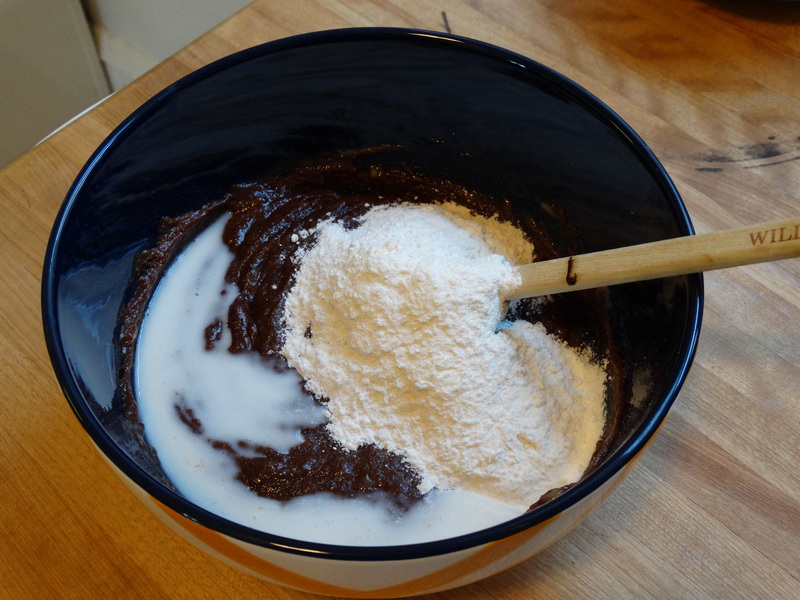 2) In a medium mixing bowl, add the flour, baking soda, baking powder and salt. Use a whisk to combine. 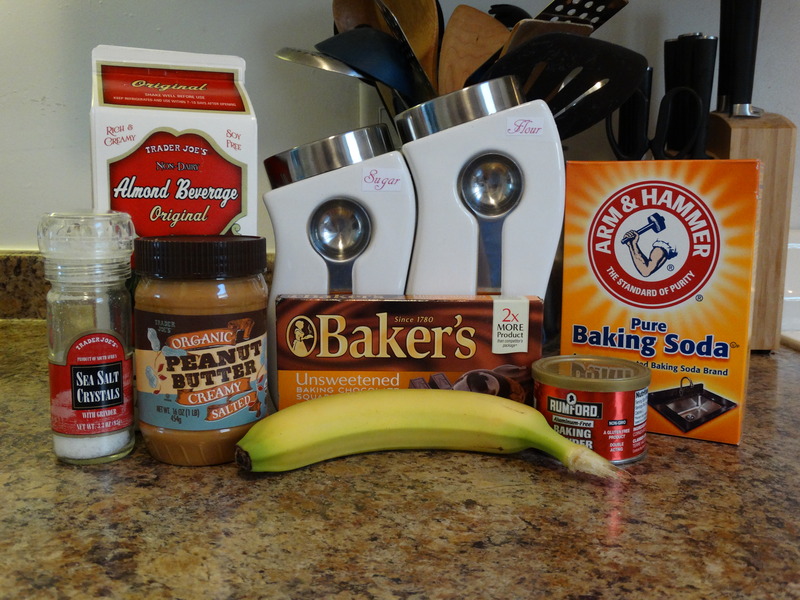 3) In a large mixing bowl, add a banana and your sugar. Use a fork to combine the two until they form a paste. Then add in the peanut butter and melted chocolate. 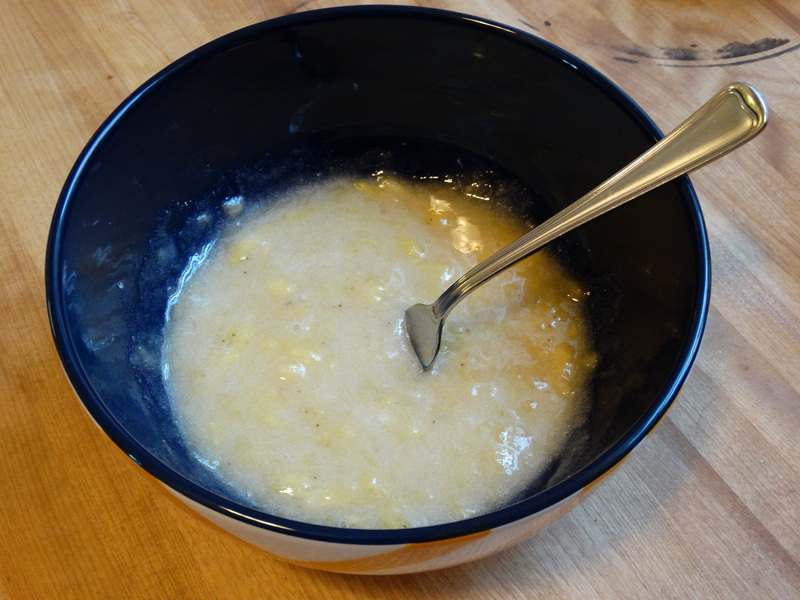 4) Mix in half of the flour mixture and half of the soy milk into your large bowl with the banana. Stir to combine. Add remaining flour and milk, again stirring to combine. 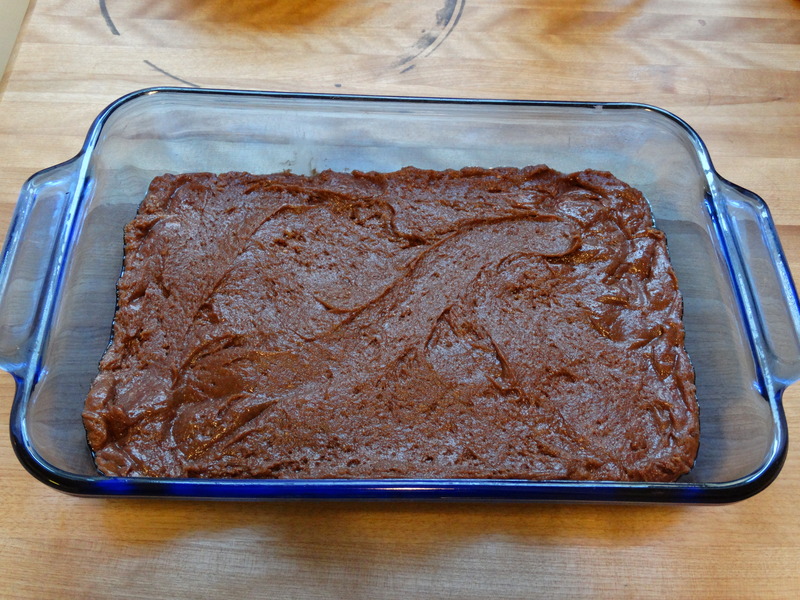 5) Pour the batter into a greased 8″ x 8″ pan. Spread to the edges if necessary. 6) Bake for 25 – 30 minutes or until done. Cool for 10 minutes and enjoy! Wow these look amazing! Banana is such a good substitue for eggs and with peanut butter I’m sure these couldn’t be better.